Here is a list of terms I found on presentation slides which were shown to us today at the Dassault Systemes 3DEXPERIENCE FORUM Europe 2012. It is important to note that these are titles of slides. Not parts of sentences or bullet points explaining the a slide. There may be more terms that I missed. Either all these things mean the same thing or they don’t. If its the former then I think Dassault Systemes may have a big messaging problem. If its the latter they have something much more than a messaging problem. I’m no branding expert. I’m just using plain old common sense here. This is the slide that explains things rather nicely. When Dassault Systemes started out they concentrated on creating software to do 3D design. When they got that right, they decided to work towards digital mockup (DMU) which the company defines as “the virtual design and simulation in 3D of a product and all of its components”. When they got that right, they decided to move towards Product Lifecycle Management (PLM). That was in 1999. And now in 2012 the company is looking to reinvent itself by doing something completely different. Simply put, 3DEXPERIENCE is the term that Dassault Systemes is using to describe the tools and infrastructure that it offers its customers to help differentiate themselves and their products/services from their competition. As always, things are best explained by an example. In my last post I mentioned why I thought that Starbucks was a bad example to justify higher prices due to a so-called superior user experience. Waiting in line at Starbucks feels exactly as painful as waiting in line for regular coffee at a fast food place. But imagine if every Starbucks outlet had something that made waiting in line an enjoyable thing. Maybe the use 3D technology to provide a enjoyable distraction or social technologies to provide a pleasant way to spend time as you wait for your coffee. Basically, Dassault Systemes is offering their customers ways to offer their customers downstream a better experience while using their products thereby enhancing the value of their products a great deal. 3DEXPERIENCE is really as simple as that. Now getting back to the lofty terms I first mentioned above, the ten brands of Dassault Systemes form the “3DEXPERIENCE platform”. 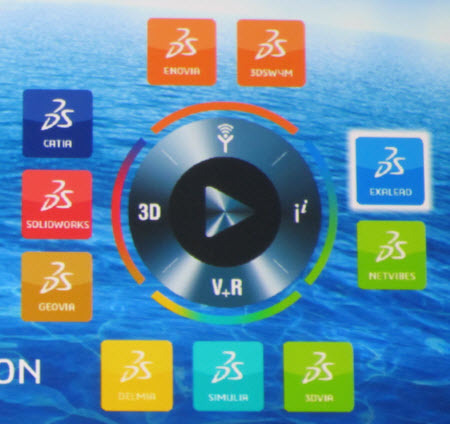 Customers of Dassault Systemes use/deploy this platform to create something called “3DEXPERIENCE universes” meant for their downstream customers to live in and enjoy. I have no clue what “Business Experience Platform”, “Social Industry Experiences” and “Engineered Business Experiences” means. I invite someone from Dassault Systemes to post a comment explaining if these things are something different than what I explained above about 3DEXPERIENCE universes. The V5 platform was about PLM and how to help businesses manage the lifecycle of their products. The V6 platform (essentially the 3DEXPERIENCE platform) is meant to manage the experiences that end customers have while using the same products. The purpose of Dassault Systemes is to be a provider of the technologies and infrastructure that are needed to manage these end customer experiences. 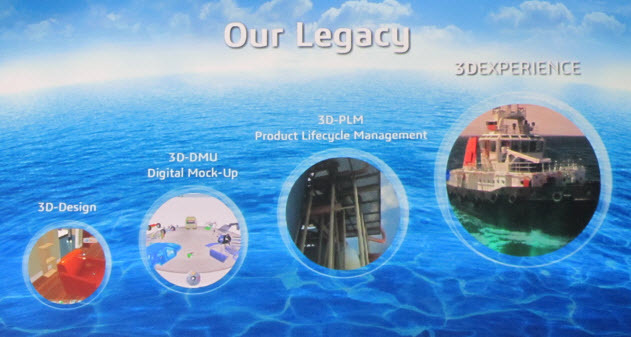 That’s why Dassault Systemes calls itself the 3DEXPERIENCE company. OK, now that we have got the 3DEXPERIENCE explanation out of the way, let me offer my two cents on something else related to the Dassault Systemes branding and messaging. I’m not sure I like the way Dassault Systemes is putting things across to people. They have this thing called the compass which describes the idea of 3DEXPERIENCE. It has four quadrants in which their ten brands reside. This symbol is supposed to be seen by all Dassault Systemes customers which now includes consumers. Completely non-technical people. This symbol is actually used in some of Dassault Systemes software today. The idea is that people will click on the four quadrants or the middle play button and they will be taken somewhere else. Take a closer look at the symbol in the right quadrant. They have actually used a mathematical symbol (exponentiation) to describe Exalead and Netvibes. I’m not sure what the plus sign is doing between V and R? Virtual Reality is a perfectly acceptable term. There is really no need to confuse things. Just keep the message simple. It will be better understood by people and you don’t need to spend time and money explaining it them. 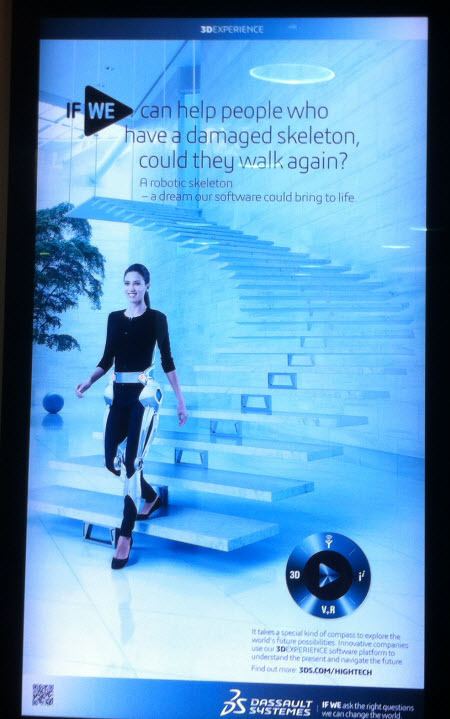 This ad is not located at the venue of the at the 3DEXPERIENCE Forum. I took this picture at the Brussels railway station. Dassault Systemes is running these marketing campaigns to built brand awareness among consumers. And these ads have the compass on them. I wonder what people think when they see that compass as they walk past the ad in the railway station. That compass give me the impression that there are some really complicated things going on here. Consumers don’t like complicated things. On the other hand, engineers thrive on complexity. So I’m really now sure what kind of people is Dassault Systemes trying to talk to. The idea of 3DEXPERIENCE is very simple. Here is a company that is looking to offer tools and/or infrastructure to not just help people build better products, but also help the end users of these products have a great experience as they use the product. It really doesn’t need to get more complicated than that with mathematical symbols and convoluted terms like “social industry experience”. I think its absolutely awesome that Dassault Systemes in thinking along these lines and putting up the money to buy companies and technologies that will help towards fulfilling this vision. Given their history, I have absolutely no doubt that they will follow through and do all these great things. Just that I wish they would explain to people what it is exactly they are doing. Because right now I’m having a very bad experience trying to understand something that I believe is actually very simple. Disclosure: Dassault Systemes paid for my air fare and hotel.